The Mayne Tigers capped off a perfect weekend yesterday at the Den with a clean sweep of wins in all four grades after getting over the top of a very improved Aspley Hornets in the main game. After demolishing the Hornets a few weeks ago at Graham Road, the Tigers were not expecting that this would be an easy repeat however the improvement in the visitors was stark, once again underlining the competitive nature of the competition. In a reminiscent performance the Aspley Hornets were everywhere in the first stanza taking the game on at every opportunity making for an exciting start to the game as both sides went goal for goal to keep supporters thoroughly engaged. The Tigers went into the second quarter with a nine point advantage but struggled to contain the Hornets enthusiasm as they ran and tackled their way to wrest the lead away to win the quarter. It was time for the Tigers to defend and once again it was Dean Hartley who stepped up to lead the backline and contain the opposition attack. Meanwhile it was diminutive wingers Jack Coghlan and Jasper Craven that were providing plenty of run and carry through the middle but the Tigers could not convert their opportunities against the hard working Hornet defence who seemed to have it over the home side. The main break was a welcome chance for the Tigers to regroup while the Hornets were up and about ready to continue their advantage. However, it was the Tigers who made the most of their half time staminade as they came out firing with intent. 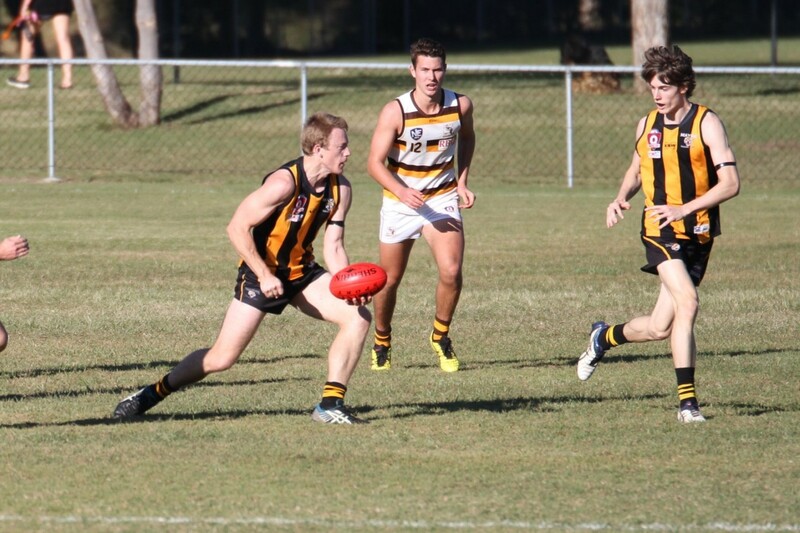 The hard work in the middle by Caleb Brown, Sam Paterson and Jack Collings was now paying off as the Tiger forwards received plenty of quick entries which they shared around through five goal kickers to take them to a commanding lead at the last break. The last term was more of the same as the Tigers kicked away again on the back of some impressive centre clearance work. 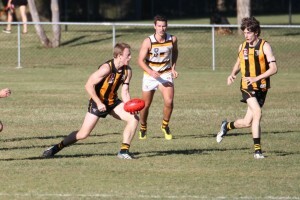 Tiger’s ruckman Luke Radonich worked hard all day to get over the top of his opponents to provide first touch while also providing a contest around the ground. In the end the Tigers were too strong for a brave Hornets outfit who no doubt will be disappointed with their second half after showing plenty of spirit early. The competition takes a break next weekend with the South East Queensland team playing North Queensland in Cairns. This leaves four rounds to play and only one remaining home game for the Tigers. 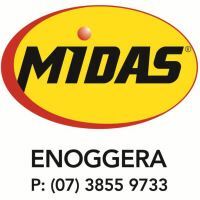 The Tigers will play Caloundra at North Street on the 23rd July in another important clash as every club in the final four looks to win all their remaining games. Goals: J Craven, A Housego 3, S Paterson, C Brunnenmeyer, L Faulkner 2, Z McLean, J Caldow, C Brown, J Harvey, J Collings 1. Best: D Hartley, C Brown, S Paterson, Z McLean, J Craven, J Coghlan.